Device Guide : Balego & Associates Inc. - BalegoOnline.org, Providing the Products You Want and the Services You Need Since 1984. The “interferential” crossing of similar high energy currents produces a very high level of deep, intense stimulation. Four electrodes from 2 channels each intersecting over the pain site. A single channel of 2 electrodes can be used for small areas that cannot accommodate 4 electrodes. Note: Interferential is a high output current. An AC adapter should be used as batteries will last only for short periods. TENS produces a low level stimulus or intermittent current to comfortably stimulate surface nerves. Narrow Pulse Width settings 10-120 for small areas such as hands and face. Two channels of 2 electrodes each can be used to independently treat 2 separate areas of pain. There are many modes of stimulation available on a variety of TENS models. -Conventional Mode delivers a constant and steady beat of rate from 1-200 pulses per second. This is the most widely used mode of treatment. -Burst Mode delivers a packet or burst of 7-10 pulses rather than a single pulse. Burst is more comfortable than conventional modes when using low Hz settings. -Modulated rate, width and amplitude modes deliver constantly varying rates, width and amplitudes to reduce sensory accommodation. -Strength Duration Modes deliver a modulated current to match the strength duration threshold curve of pain. -Han Therapy modes deliver a mix of stimuli to produce the full spectrum of the body’s own pain modulators. Microcurrent is measured in microamps or millionths of an ampere, versus TENS which is in the milliampere or thousandth of an ampere range. Microcurrent output is designed to more closely parallel the body’s natural electrical currents. There is no sensation of stimulation. 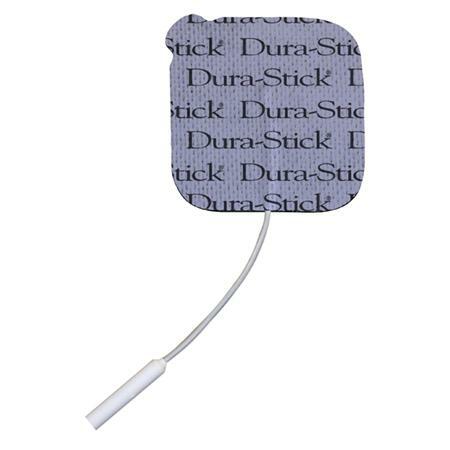 Electrodes should be placed directly over the area of pain. The HVPC waveform delivers an extremely comfortable but powerful stimulus. The waveform is excellent for deep penetrating stimulation. HVPC is commonly used in pain, swelling, contusions, sprains and strains. Two channels of stimulation consisting of a single dispersive pad and 2 smaller active electrodes which can be used to independently treat 2 separate areas of pain. A single channel of a red and a black electrode can be used for smaller areas. Electrodes should be placed directly over the area of pain. Note: HVPC is a high output current. An AC adapter should be used as batteries will last only for short periods. Neuromuscular stimulation is designed to provide a comfortable current stimulus to cause an involuntary passive muscle contraction. Neuromuscular stimulators are used predominantly for muscle re-education and prevention or retardation of disuse atrophy. It can also be used as a manual stimulus for muscle functional training. NMES uses ON/OFF stimulation times to mimic active exercise contraction/rest periods and Ramp Up and Ramp Down times for comfortable muscle contracting. It is used where active exercise is not easily achieved or isolation of specific muscle is required. Unlike TENS, NMES uses long pulse duration waveforms to contract muscle. Two channels of 2 electrodes each can be used to independently exercise 2 separate muscles. Electrode placement is critical in order to stimulate the correct muscles and to stimulate the targeted muscles correctly and is usually done by a Physical Therapist. One electrode is placed over the insertion of the muscle at the tendon and the other electrode is placed over the muscle belly.